Our annual Summit brings together state and national STEM (science, technology, engineering, and math) thought-leaders, innovators, and champions who are united by a passion to advance excellence, innovation, and equity in STEM education. At the Summit, business, education, and community leaders will come together to support the success of Washington students in STEM education and career pathways. STEM leaders from across the state will participate in excursions to see STEM and career connected learning in action, participate in workshops, and hear from engaging speakers. This year, we’ll have a special focus on two critical junctures where our thinking could have the biggest impact on student lives: early math and launching students into high-demand career pathways. 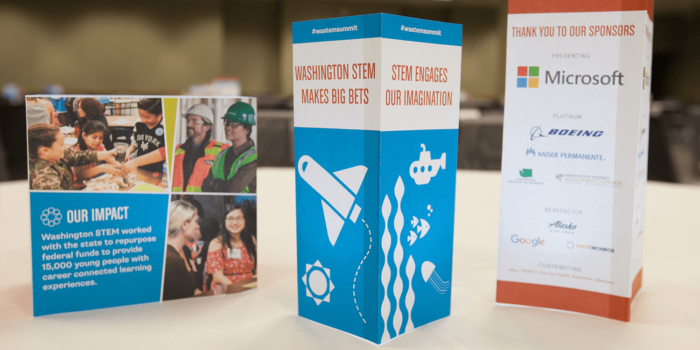 This year’s Washington STEM Summit will be by invitation only. For more information, please contact Megan Nadan.